Bengaluru, 6thMarch, 2017: An awareness programme was organized by the Department of Telecommunications (DoT), Min. of Communications on Electromagnetic Field (EMF) Emissions and Mobile Towers. This is part of a nationwide public outreach campaign to dispel myths about EMF Emissions and quell unfounded fears of citizens through scientific evidence. Shri. Anil Kumar V. Wagh, Director, TERM Karnataka delivered the welcome speech and highlighting the importance of mobile connectivity across the state and emphasizing on the need of cultivating a scientific temper and deepening collaboration between the public, Government and industry for growth and progress of Bengaluru. Shri Kantharaj, Assistant Commissioner of Police, South Division, Bengaluru City, Shri. S.R.N. Prasad, Deputy Director General, TERM, Bengaluru, Shri. M. A. Khan, Deputy Director General, TERM Karnataka & Dr. Madhu Y C, Senior Surgical Oncologist graced the occasion. Representatives of civil society and representatives of Residents Welfare Associations of Bangalore south were invited. 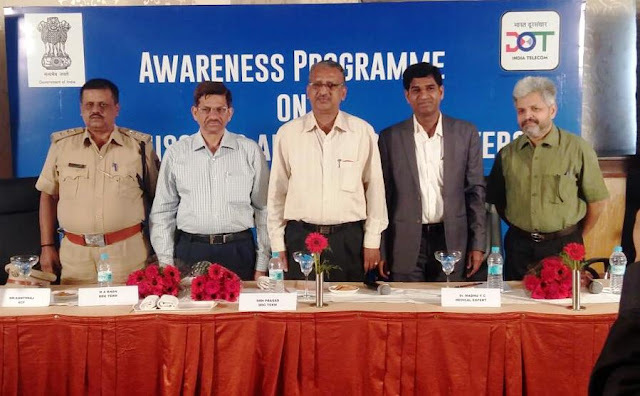 An expert panel comprising of telecom officers and the doctor presented the scientific facts clarifying various myths on possible health hazards from mobile tower radiation. Delivering the technical address Shri. Surendran. V, Director, TERM, Bengaluru said, that such an initiative was necessitated due to the increasing resistance faced by the Telecom Service Providers for erecting towers for improving quality of service in response to customers demand. Detailing various technical aspects and regulatory precautions taken by the government, it was pointed out by him that the resistance is due to perceived ill effects and not based on facts. It was further pointed out by him that the towers are safe and state of Karnataka requires more towers for meeting the expectations of the customers. Dr. Madhu YC, Surgical Oncologist, during his presentation referred to various research works undertaken Globally, including the ones done by premier institutions like AIIMS in India. He pointed that to date there is no evidence to conclude that exposure to low-level electromagnetic fields is harmful to human health and quite often, the problems faced by the public are due to perception, fear of unknown and hear say. Shri. SRN Prasad, DDG TERM, Bengaluru also pointed out that TERM Cells conducts physical audit of 10% of the sites every year and such tests are done without any prior intimation to Service Providers to ensure correct assessment of compliance status. Out of 50000 Base stations available across 11000 sites in Bangalore Urban and Rural districts and Ramanagara, 15000 base stations in more than 8000 sites have been tested so far. The first session concluded with an interactive Q&A session between senior government officials of Bengaluru, participants from civil society and RWAs. 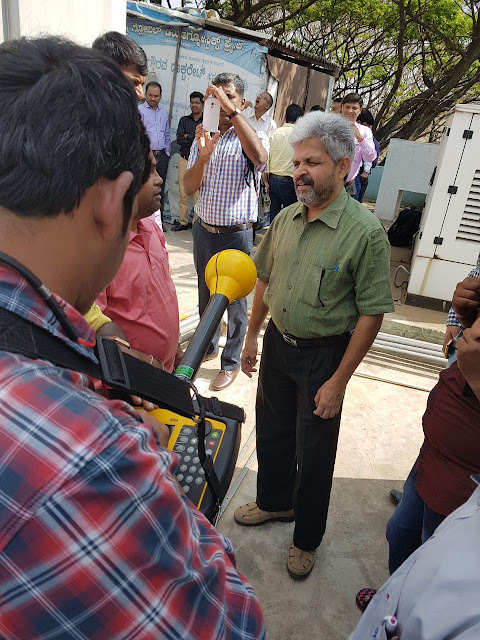 In the next session actual site, testing was carried out to measure electromagnetic frequency (EMF) emissions from mobile towers in JP Nagar, Bengaluru. It was found that the mobile towers in Bengaluru were transmitting well within permissible limits and, in fact, in most cases much lower than the prescribed limits in India. The testing was conducted for BTS at No.54,15th Cross,100 ft. Rd, JP Nagar II Phase and the results were shared with the people present at the sites, stating that all towers are safe, substantiated by the low levels of radiation that showed up in the tests.